With it’s diverse population Canada has a reputation for being an egalitarian country, so it may come as a surprise that Canada ranks only 20th when it comes to gender equality. A major problem for Canada is the gendered wage gap. Among the 34 nations of the Organisation for Economic Co-operation and Development (OECD), Canada ranks as the 4th worst country for gendered inequality in wages, ahead of just Korea, Japan, and Germany. This inequality exists despite the fact that more women than men are attaining post-secondary degrees. Part of this may be explained with the career choice differences between men and women, with fewer women pursuing high paying jobs in scientific fields such as engineering (24%) and computer sciences (18%). This would not account for the whole of the gender wage gap. It is also possible that jobs such as these pay higher because they have few women and traditionally have been viewed as careers for men. When it comes to the number of employed women Canada does pretty well with 69% of women being employed. This is 9% higher than the OECD average of 60%, but there are still a disproportionate number of women working part time jobs (27%) versus men (12%). This contributes to why Canada ranks so poorly overall, because the gendered wage gap is highest for people in the lowest wage percentiles. For people in the 20th percentile of wages in Canada are again fourth last in gender wage differences ahead of just Korea, Japan, and Germany. When it comes to higher wage earners Canada actually ranks fairly well. The wage gap amongst people in the 80th percentile puts Canada in 7th amongst OECD nations. The benefits of this are minimized, however, due to the fact that fewer women are in the higher wage percentiles in Canada, despite the high numbers of women attaining post-secondary degrees. 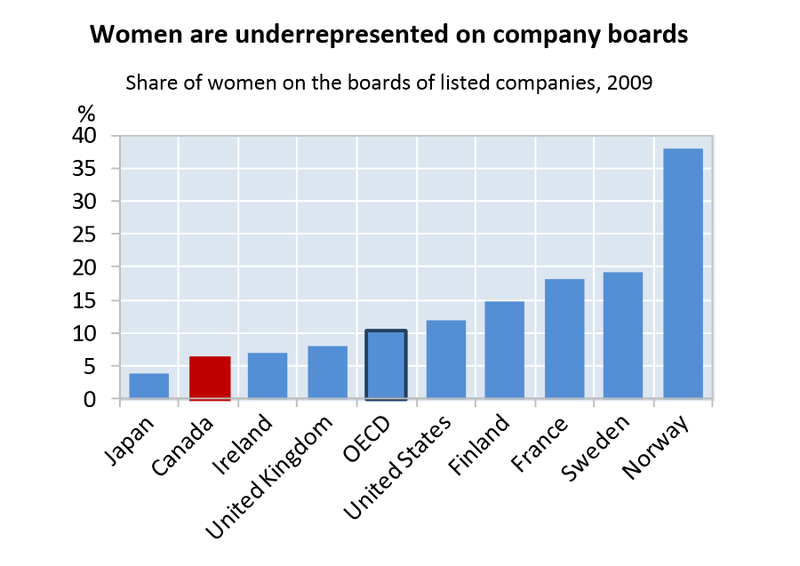 In 2009 the percentage of women on the boards of Canadian companies, big enough to be listed on the stock exchange, was just 6%, little better than half the OECD average of 10%. This is likely due to the metaphorical glass ceiling. Another major factor for the gender wage gap in Canada is childcare. The affordability and quality of childcare in Canada falls behind many of the nations in the OECD. The need to take time off work for child rearing effects a woman’s ability to attain higher paying jobs. This is reflected in the fact that the wage gap is higher for women between 25 and 44 with at least one child (29%) versus women between the ages of 25 and 44 with no children (7%). Evidence of this can also be seen in Quebec. In 1997 they started a universal low fee childcare program. The labour force participation of women in Quebec was four points lower than the rest of Canada, but after introducing this program it has risen to higher than the national average. Steps have been taken to eliminate the wage gap in Canada. On a federal level Canada introduced the Pay Equity Program to eliminate gender based wage discrimination, but have since declared men and women equal and stopped the program. Many of Canada’s provinces have also introduced their own programs to reduce the gender wage gap. Some provinces are going even further, for example, Quebec has made it a requirement to have both men and women represented on the boards of their crown corporations. Despite the steps taken it is clear that Canada still has a long way to go to improve their international ranking in the gender wage gap and longer still to eliminate the gap altogether. For more information from the OECD, about the gender wage gap click here. For those interested in reading more on the wage gap in Canada click here. For those interested in what the Federal government is doing to eliminate the wage gap click here.